Reinbek bei Hamburg: Rowohlt Taschenbuch Verlag, 1998. 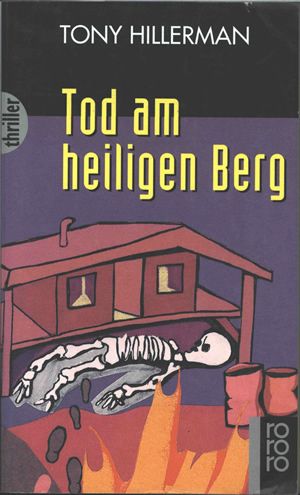 This is the first German paperback edition of The Fallen Man by Tony Hillerman. The German title translates literally as "Death on the Holy Mountain." The first edition was published by Rowohlt Taschenbuch Verlag in Hamburg in 1998. The translation into German was done by Klaus Fröba. Cover design is by Wolfram Hämmerling and the illustration is by Britta Lembke. The front cover features a sketch of a house in dark pink on a purple background. In front of the house is human skeleton lying on the ground, with footsteps leading toward it out of the foreground. Some abstract shapes in red and orange in the foreground suggest flames. The book title is printed in yellow above the illustration. The series logo "rororo" is printed in gray on black at the bottom outside corner of the front and back covers. The back cover is black and features a synopsis, printed in white. The bar code is at the bottom of the back cover. Binding: Paper covers. The thriller number, novel title, author name, and publisher logo are printed on the spine.